Loving your neighbor as yourself is a commandment that the Lord Jesus required us to observe. Which Bible verses are about this aspect? Let’s read these 12 popular Bible verses together and learn how to love others. 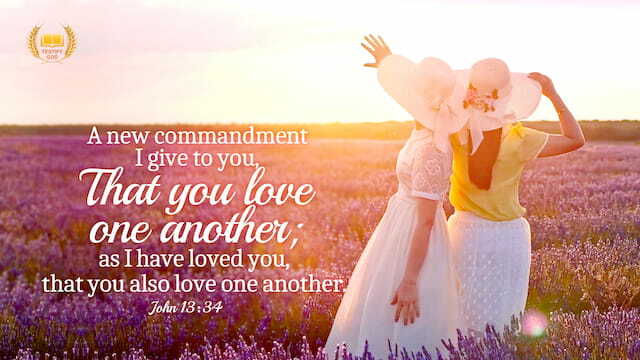 A new commandment I give to you, That you love one another; as I have loved you, that you also love one another. By this shall all men know that you are my disciples, if you have love one to another. Therefore all things whatever you would that men should do to you, do you even so to them: for this is the law and the prophets. Owe no man any thing, but to love one another: for he that loves another has fulfilled the law. And above all things have fervent charity among yourselves: for charity shall cover the multitude of sins. Use hospitality one to another without grudging. As every man has received the gift, even so minister the same one to another, as good stewards of the manifold grace of God. And he answering said, You shall love the Lord your God with all your heart, and with all your soul, and with all your strength, and with all your mind; and your neighbor as yourself. And Jesus answered him, The first of all the commandments is, Hear, O Israel; The Lord our God is one Lord: And you shall love the Lord your God with all your heart, and with all your soul, and with all your mind, and with all your strength: this is the first commandment. And the second is like, namely this, You shall love your neighbor as yourself. There is none other commandment greater than these. Beloved, let us love one another: for love is of God; and every one that loves is born of God, and knows God. He that loves not knows not God; for God is love. Charity suffers long, and is kind; charity envies not; charity braggs not itself, is not puffed up, Does not behave itself unseemly, seeks not her own, is not easily provoked, thinks no evil; Rejoices not in iniquity, but rejoices in the truth; Bears all things, believes all things, hopes all things, endures all things.Charity never fails: but whether there be prophecies, they shall fail; whether there be tongues, they shall cease; whether there be knowledge, it shall vanish away. » You may be interested in reading more on our Interpersonal Relationships page, or in the articles below. Can Man Enter Kingdom of Heaven by Laboring for the Lord? Bible verses about the Lord Jesus teaching His disciples how to pray are the most familiar to Christians, which is known as the Lord’s Prayer. Let’s contemplate and ponder the Lord Jesus’ prayer. May the Holy Spirit enlighten us to understand the truth in each word of the prayer. We collected some Bible verses about about the birth and work of Jesus Christ. Thank God for His salvation to us, and enjoy the peace and joy from God. And it was so, when the days of their feasting were gone about, that Job sent and sanctified them, and rose up early in the morning, and offered burnt offerings according to the number of them all: for Job said, It may be that my sons have sinned, and cursed God in their hearts. Thus did Job continually. (Job 1:5) Behold, how good and how pleasant it is for brothers to dwell together in unity! (Psalm 133:1) He that works deceit shall not dwell within my house: he that tells lies shall not tarry in my sight. (Psalm 101:7) And you shall bestow that money for whatever your soul lusts after, for oxen, or for sheep, or for wine, or for strong drink, or for whatever your soul desires: and you shall eat there before the LORD your God, and you shall rejoice, you, and your household, (Deuteronomy 14:26) Likewise, you wives, be in subjection to your own husbands; that, if any obey not the word, they also may without the word be won by the conversation of the wives; (1 Peter 3：1) To the woman he said, I will greatly multiply your sorrow and your conception; in sorrow you shall bring forth children; and your desire shall be to your husband, and he shall rule over you. (Genesis 3:16) And they said, Believe on the Lord Jesus Christ, and you shall be saved, and your house. 32And they spoke to him the word of the Lord, and to all that were in his house. 33And he took them the same hour of the night, and washed their stripes; and was baptized, he and all his, straightway. 34And when he had brought them into his house, he set meat before them, and rejoiced, believing in God with all his house. (Acts 16:31-34) Peace be with you all! Dear brothers and sisters, if you have any understanding or enlightenment from God, you’re welcome to share with us.1. Via the online chat window at the bottom right corner of the screen.2. Send an email to info@testifygod.org.We sincerely hope we’ll grow spiritually through sharing with each other. Prayer is very important for Christians. Then how can we pray in accordance with the Lord’s will? This passage selects Bible verses about the Lord Jesus’ teaching about prayer. Let’s follow the Lord’s teaching to learn how to pray and ponder the truth in each word of the Lord’s prayer. Matthew 6：5-15 5 And when you pray, you shall not be as the hypocrites are: for they love to pray standing in the synagogues and in the corners of the streets, that they may be seen of men. Truly I say to you, They have their reward. 6 But you, when you pray, enter into your closet, and when you have shut your door, pray to your Father which is in secret; and your Father which sees in secret shall reward you openly. 7 But when you pray, use not vain repetitions, as the heathen do: for they think that they shall be heard for their much speaking. 8 Be not you therefore like to them: for your Father knows what things you have need of, before you ask him. 9 After this manner therefore pray you: Our Father which are in heaven, Hallowed be your name. 10 Your kingdom come, Your will be done in earth, as it is in heaven. 11 Give us this day our daily bread. 12 And forgive us our debts, as we forgive our debtors. 13 And lead us not into temptation, but deliver us from evil: For your is the kingdom, and the power, and the glory, for ever. Amen. 14 For if you forgive men their trespasses, your heavenly Father will also forgive you: 15 But if you forgive not men their trespasses, neither will your Father forgive your trespasses. » We’d like to share with you the article: • The Mystery in the Lord’s Prayer: Is the Kingdom of God Really in Heaven? • 4 Aspects Christians Need to Know About Praying to God • Three Principles of Prayer Help You Keep Temper Peace be with you all! Dear brothers and sisters, if you have any understanding or enlightenment from God, you’re welcome to share with us.1. Via the online chat window at the bottom right corner of the screen.2. Send an email to info@testifygod.org.We sincerely hope we’ll grow spiritually through sharing with each other. Which are the verses about grace in the Bible? What is real grace? Read these Bible verses about grace to know God’s grace, and understand the Lord Jesus’ salvation. Exodus 34:6 And the LORD passed by before him, and proclaimed, The LORD, The LORD God, merciful and gracious, long-suffering, and abundant in goodness and truth. 2 chronicles 30:9 For if you turn again to the LORD, your brothers and your children shall find compassion before them that lead them captive, so that they shall come again into this land: for the LORD your God is gracious and merciful, and will not turn away his face from you, if you return to him. 2 corinthians12:9 And he said to me, My grace is sufficient for you: for my strength is made perfect in weakness. Most gladly therefore will I rather glory in my infirmities, that the power of Christ may rest on me. Nehemiah 9:31 Nevertheless for your great mercies’ sake you did not utterly consume them, nor forsake them; for you are a gracious and merciful God. » We’d like to share with you the article: • What Is God’s Greatest Grace for Man? • What Is God’s Grace? What Does God’s Grace Include? Psalm 30:5 For his anger endures but a moment; in his favor is life: weeping may endure for a night, but joy comes in the morning. Psalm 103:8 The LORD is merciful and gracious, slow to anger, and plenteous in mercy. Isaiah 55:3 Incline your ear, and come to me: hear, and your soul shall live; and I will make an everlasting covenant with you, even the sure mercies of David. Daniel 9 :13 As it is written in the law of Moses, all this evil is come on us: yet made we not our prayer before the LORD our God, that we might turn from our iniquities, and understand your truth. Joel 2:13 And rend your heart, and not your garments, and turn to the LORD your God: for he is gracious and merciful, slow to anger, and of great kindness, and repents him of the evil. John 1:14 And the Word was made flesh, and dwelled among us, (and we beheld his glory, the glory as of the only begotten of the Father, full of grace and truth. » We’d like to share with you the article: • Understanding the grace of God: The Great Fear and Greater Grace Found When My Children Became Ill • God’s Grace and Love Accompanys Him Through Death John 1:17 For the law was given by Moses, but grace and truth came by Jesus Christ. Romans 3:24 Being justified freely by his grace through the redemption that is in Christ Jesus. Romans 5:2 By whom also we have access by faith into this grace wherein we stand, and rejoice in hope of the glory of God. Romans 5:15 But not as the offense, so also is the free gift. For if through the offense of one many be dead, much more the grace of God, and the gift by grace, which is by one man, Jesus Christ, has abounded to many. Romans 5:21 That as sin has reigned to death, even so might grace reign through righteousness to eternal life by Jesus Christ our Lord. 2 Corinthians 8:9 For you know the grace of our Lord Jesus Christ, that, though he was rich, yet for your sakes he became poor, that you through his poverty might be rich. 2 Timothy 1:9 Who has saved us, and called us with an holy calling, not according to our works, but according to his own purpose and grace, which was given us in Christ Jesus before the world began. 1 Peter 5:10 But the God of all grace, who has called us to his eternal glory by Christ Jesus, after that you have suffered a while, make you perfect, establish, strengthen, settle you. Peace be with you all! Dear brothers and sisters, if you have any understanding or enlightenment from God, you’re welcome to share with us.1. Via the online chat window at the bottom right corner of the screen.2. Send an email to info@testifygod.org.We sincerely hope we’ll grow spiritually through sharing with each other.